Andrew N. Schock is an Associate in the Energy industry group, focusing primarily on commercial litigation. He practices out of the Firm’s office in Akron, Ohio. Andrew’s practice focuses on oil and gas and construction issues. His previous experience as a landman and title examiner for an energy consulting group provides him with in-depth background knowledge, used to his clients’ advantage. 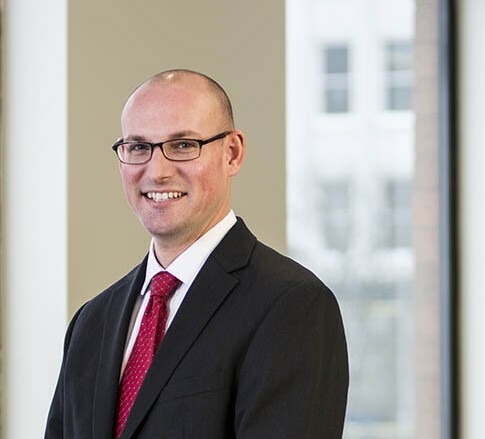 He’s very familiar with oil and gas leasing and title issues, and he thoroughly enjoys his work researching and arguing emerging issues in Ohio. He’s briefed and argued numerous oil and gas cases on issues including deed interpretation, application of the Ohio Dormant Mineral Act, application of the Ohio Marketable Title Act, lease termination or forfeiture, paying quantities and habendum clauses, forced unitization issues, slander of title, and implied covenant claims. Along with his experience in litigation, Andrew has experience conducting title examinations and drafting certified oil and gas title opinions as well as due diligence and title defect curative work. In addition to oil and gas related litigation, Andrew represent clients in cases involving pharmaceutical torts, creditor’s rights, construction issues, and various other commercial issues. Andrew’s interests outside of work focus on water rather than land. He loves tropical fish, so if you’ve never seen a cichlid (or don’t know what one is), Andrew would be more than happy to show you. In fact, he breeds the tropical fish in his home and ships them to other hobbyists throughout the United States. He’s even won multiple awards for his photography of fish in his aquariums.